Because of our specialty and dedication to the upright bass and the large volumes that we buy and make them, we are in a perfect place to sell and offer extremely fine professional caliber cellos yet at super low 'student' level prices. There is no middleman or shop to 'up charge' or elevate our retail price. Here, we have the best cellos for your money. What's so great about our cellos? Again, because of our large volumes of basses we also can buy cellos (at our own high specifications) and cut the price in half. What this does is offer an extremely well made, high quality cello that will be a much better deal to the buyer. The packages that we offer include cello cases and bows that are actually included in at our own wholesale costs, making the total an extremely attractive price. Thompson cellos are our most affordable cello and start at $1,795. The Gillet cellos start at $3,450 with case. What's the difference between the Thompson and the Emile Gillet cellos? 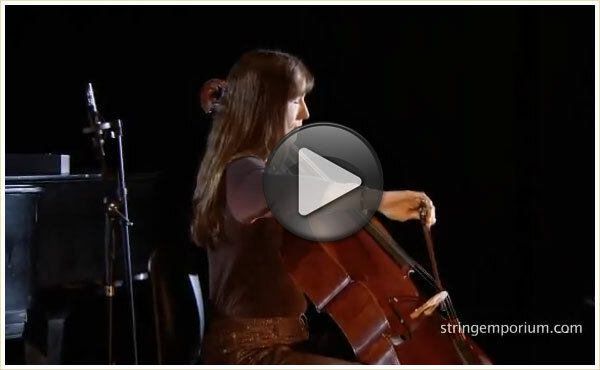 The Gillet cellos were our first cello offering several years ago. The main difference is that the Gillet cellos have the highest grade, very flamed (attractive) wood which just off the bat raises the price significantly. Buying the best, most attractive maple can be very expensive. They Gillet cellos are also tap tuned by expert makers that require the instrument to be pretested for the best tone and resonance. So the Gillets not only look like the best cellos, they sound like it. The Thompson cellos are made from more plainer looking maple, but still have attractive grain with a deep and lush, hand rubbed varnish. The Gillet cellos only come with the best sets of cello strings: Tungsten Spirocore C & G, with Larsen A and D strings. The Thompsons come in different string assortments that vary in price which can be chosen by the customer. How to try and buy. We keep trials on our cellos very simple: Once the desired cello, case and package (with strings) is decided on, we ship it to you for a two week trial. Shipping is free (for domestic USA) so long as the cello is purchased, which most do. If the cello is returned, we ask that our customers repay us for the initial shipping charges. Shipping is usually below $80. Customers and choose any string combinations or brands at no additional cost. Please go to our main String Emporium cello pages so that you can see more detailed information and photos. Need help? Feel free to call us, 800-600-2689 (480-785-5491).